Just finished this little nugget and holy wow is it so freaking good. First of all, I'll point out that this author also wrote one of my fave mermaid series ever (The Waterfire Saga), so obviously I had to read this one immediately. It's a total page-turner that explores the ideas of free will vs. destiny, and what could have happened if Cinderella's stepsisters had been given the opportunity to choose their own fate. The story is told from Isabelle's point of view, and I really enjoyed getting to know her. Since this book stems from the original Grimm fairytale, I will say it's a little dark at times, with some heavy themes in terms of target age range. Also there's cursing so if you don't like your kids reading bad words in their books maybe hold off on this one for a couple years. Other than that, I TOTALLY recommend this book. To anyone and everyone. I think adults will connect with this one too. It's a timeless tale of empowerment that we could all use a reminder of now and then. A startling, fiercely feminist re-imagining of Cinderella from the bestselling, award-winning author Jennifer Donnelly. Don't just fracture the fairy tale. Shatter it. Isabelle should be blissfully happy-she's about to win the handsome prince. Except Isabelle isn't the beautiful girl who lost the glass slipper and captured the prince's heart. She's the ugly stepsister who cut off her toes to fit into Cinderella's shoe . . . which is now filling with blood. Isabelle tried to fit in. She cut away pieces of herself in order to become pretty. Sweet. More like Cinderella. But that only made her mean, jealous, and hollow. Now she has a chance to alter her destiny and prove what ugly stepsisters have always known: it takes more than heartache to break a girl. 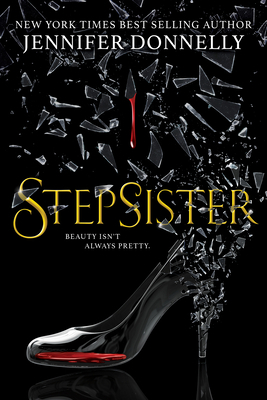 Evoking the darker, original version of the Cinderella story, Stepsister shows us that ugly is in the eye of the beholder, and uses Jennifer Donnelly's trademark wit and wisdom to send an overlooked character on a journey toward empowerment, redemption . . . and a new definition of beauty. Jennifer Donnelly is the author of A Northern Light, which was awarded a Printz Honor and a Carnegie Medal, Revolution (named a Best Book by Amazon, Kirkus Reviews, School Library Journal, and the Chicago Public Library, and was nominated for a Carnegie Medal), the Deep Blue series, and many other books for young readers, including Lost in a Book, which spent more than 20 weeks on the New York Times bestseller list. She lives in New York's Hudson Valley.